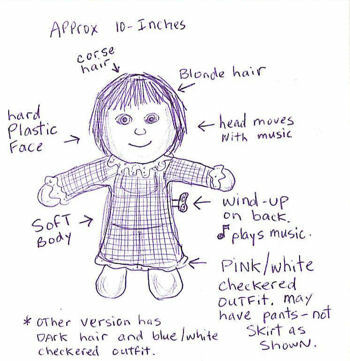 Can you help me find my lovie from early 1980’s? Two dolls in series: pink doll with blond hair and blue doll with black hair. -pink and white checkered clothing. -HEAD MOVED back and forth when wound-up -possibly a ‘K-Mart’ purchase -possibly called ‘baby wiggle’ or ‘wiggles’ but I can not find her!! Can you offer any help? I would really be so happy to find her!! I found out that it is called “Baby Wiggles” and they were made in Canada by REGAL.